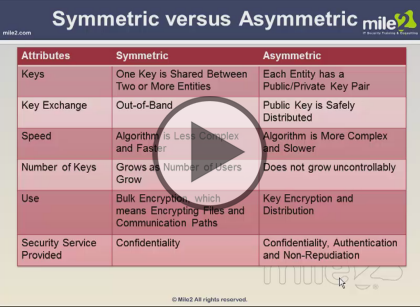 This course covers symmetric and asymmetric cryptography and their history will be covered along with topics like Public key infrastructure, and various attacks. Also network and communication security will be discussed with topics inluding: network topologies, cabling and finally end with looking at network solutions. This course is part of a series covering the ISC(2) Certified Information Systems Security Professional (CISSP). This series assumes a good understanding of enterprise networking and networking security. This is part 4 of a 9 part series.